DGS Games will have their latest releases for Freeblades, the Falkaaran Adventurers, available at GenCon next week. Following their successful Kickstarter this summer, DGS Games will release the Falkaaran Adventurers at GenCon this month. 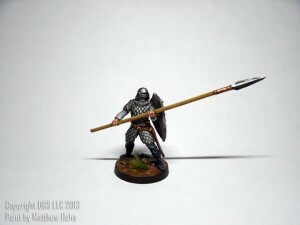 The Pikeman is highlighted here fully painted and ready to do battle.